DMX-PUTZER is just the thing for Live control of DMX Spotlights and Fixtures. Using just a few DMX Fixtures? DMX-PUTZER is the Only DMX Controller you’ll need! The DMX-PUTZER is operated using a Wireless Hand-Held Game Controller. DMX-PUTZER lets an ‘off-stage’ bandmember keep a DMX Spotlight focused on the lead guitarist or vocalist. Use the DMX-PUTZER to check out the features of new DMX fixtures or to test older fixtures for proper operation. These Putzer-Channels can be Mapped Anywhere in the First 90 DMX-Channels. Putzer-Channels can be used multiple times in different DMX-Channels, Inverted and Non-Inverted. DMX-Channels Not being Directly Controlled by Putzer-Channels can be set to Static Values of 0 or 255. Most DMX Moving Head Spotlights have many DMX ‘Control’ Channels. However, basic operations such as ‘Pan & Tilt’ and Color or ‘Gobo’ control, requires only 3 ‘Active’ Channels. The other control channels can be Set to Values of 0 or 255, and then not changed. The ‘Triangle’ Button to Tilt-Up. The ‘X’ Button to Tilt-Down. The ‘Square’ Button to Pan-Left. The ‘Circle’ Button to Pan-Right. The two Right-Front Buttons for Color or Gobo control. An additional Spotlight could be operated using the similar Buttons on the Left side the DMX-PUTZER. Pressing the ‘SELECT’ Button gives access to a 2nd Set of 6 Putzer-Channels. Press the ‘START’ Button and the Buttons Operate the 1st Set of 6 Putzer-Channels again. DMX-PUTZER Outputs 90 DMX Channels, so several Fixtures with Many control channels can be operated at the same time. 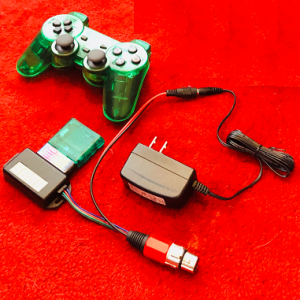 The Regulated, 5V Switching Power Supply Included with the DMX-PUTZER allows Input voltages from 90 to 240 VAC 50/60Hz for U.S. & Overseas Use, with plug adaptor. Note: Two AA Batteries required for the Wireless Hand-Held Control Pad, Not Included.